It’s not too often I post vegetarian recipes on here. I get way too many complaints from the meatarian if I dare make too many meals without any meat in them. But every once in a while I find myself home alone, and seize the opportunity to veg it up. Right after we arrived in Mississippi last week, Nick left for California for some training. Good timing, of course. Yes, of course I’d love to unpack the whole house myself! Grrr. It took a few days, but once I had most of the kitchen unpacked and was officially sick of restaurant food, I turned to my cookbook shelf to find something easy to make that would feed me for a few days. This chowder fit the bill. 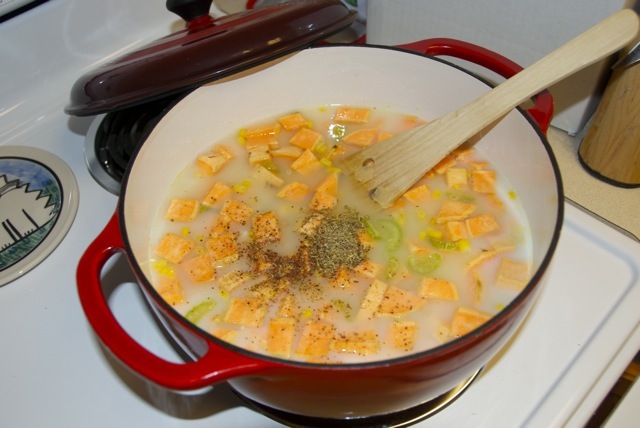 The original recipe was vegan, so I obviously changed a few things since I used milk and chicken stock. 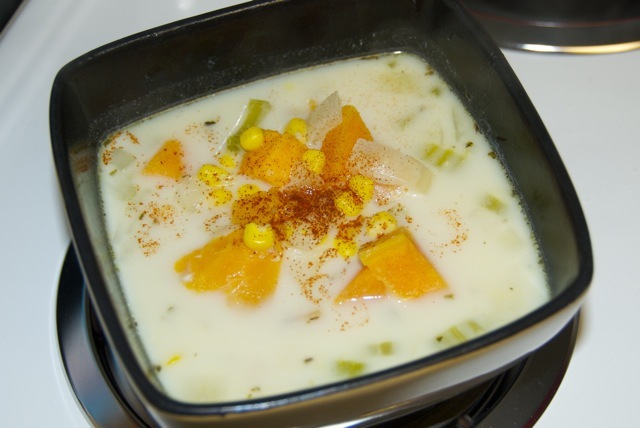 I used skim milk and while it was still delicious, it was more soupy than chowdery. 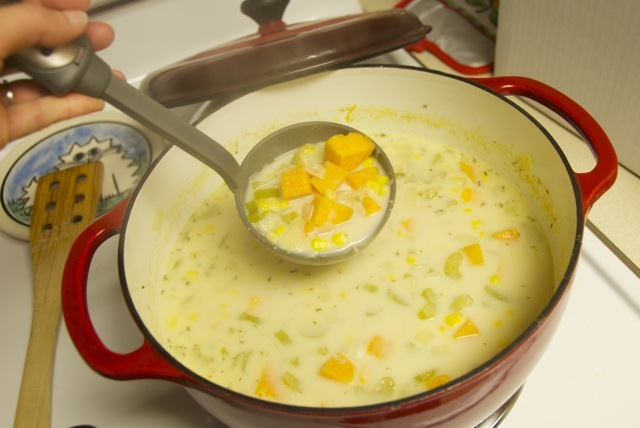 If you like your chowder creamy, I’d suggest using whole milk, but if you’re watching calories or fat, or just prefer a thinner soup, the skim works just fine! Heat oil over medium heat in a dutch oven or large pot. 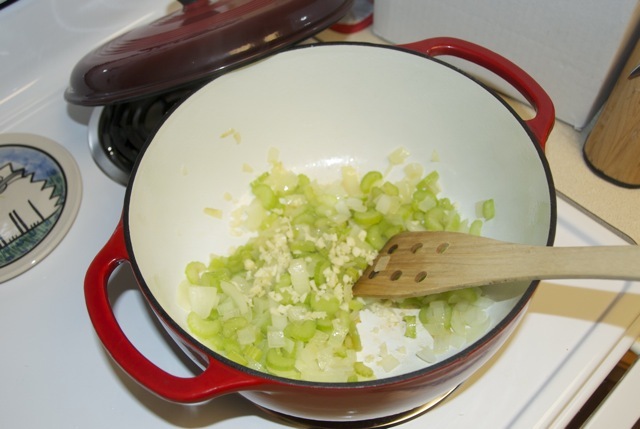 Add onion and celery and saute until soft, about 5 minutes. Add garlic and saute an additional 1 minute. 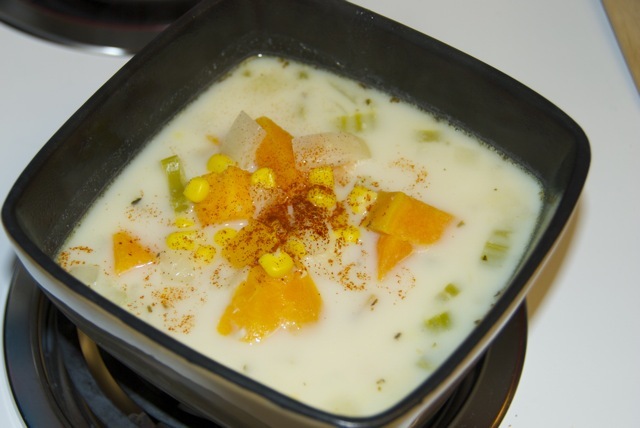 Add the potatoes, corn, broth, thyme, and milk. Simmer 20 minutes, or until potatoes are tender. In a small bowl, whisk together flour and water until smooth. Add to the soup and simmer 5 minutes. I really liked this soup. The thyme gave it a nice flavor, but I think next time I would try adding some bacon or cayenne pepper to kick it up a bit! « ‘Tis the Season… for pickles!